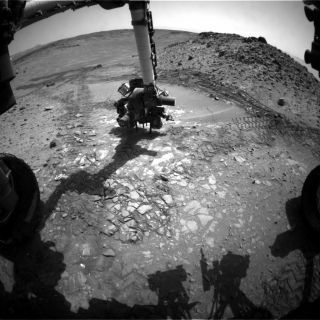 NASA's Curiosity Mars rover found the rock named, "Bonanza King," unsuitable for drilling. Image released Aug. 22, 2014. NASA's Mars rover Curiosity has passed up a potential drilling target and instead resumed the long trek to a huge Red Planet mountain. Mission team members had been considering drilling a Mars rock dubbed "Bonanza King" but scrapped the idea after pre-drilling activities suggested that the stone is not stable enough, NASA officials said. "We have decided that the rocks under consideration for drilling, based on the tests we did, are not good candidates for drilling," Curiosity project manager Jim Erickson, of NASA's Jet Propulsion Laboratory in Pasadena, California, said in a statement. "Instead of drilling here, we will resume driving toward Mount Sharp." Mount Sharp rises more than 3 miles (5 kilometers) into the sky from the center of Mars' Gale Crater. Mission scientists want Curiosity to climb up through the mountain's foothills, reading a history of the planet's changing environmental conditions as it goes. The 1-ton Curiosity rover has been rolling toward Mount Sharp since July 2013. The six-wheeled robot still has about 2 miles (3.2 km) to go before it reaches its targeted entry point near the mountain's base; Curiosity should get there by the end of the year, mission officials have said. The road to Mount Sharp has been anything but smooth. Rough terrain has taken a toll on Curiosity's metal wheels, obligating the robot's handlers to search for a smoother, less punishing route through Gale Crater. Curiosity has drilled into three rocks since touching down on Mars in August 2012. Analysis of samples collected during the first two drilling operations allowed mission scientists to determine that a region near Curiosity's landing site called Yellowknife Bay was a lake-and-stream system that could have supported microbial life billions of years ago.